Educational Qualification & Experience: B.Com with 60% marks tar General / OBC(NCL)/SC and pass mark for ST candidates. 1 year post qualification experience is mandatory in the area of F&A in a reputed organization. How to apply: For further details and Application Form. 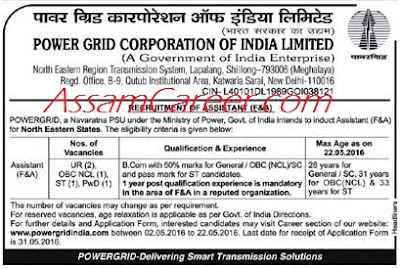 Interested candidates may vise Career section of website: www.powergridindia.com between 02.05 2016 to 22.05.2016.